About: Quiz Master is a web application for setting up and managing quizzes. This app helps to set up and manage quizzes with ease. ­­ Despite its name, it can also be used to set up an entire examination. It comes with unique features that makes this possible. For instance, the examiner can print both score and answer sheets of all students who took part in the exams and this can serve as a physical evidence of taking part in the exams. One of the most difficult tasks for examiners after a test done is marking and scoring test items. Marking itself is not an easy task but what makes it more difficult is the class size. Sometimes examiners wish to conduct as many tests as possible but are limited because of the class size. The real problem is not with the class size but ensuring that the scores are accurate. This will allow examiners to concentrate on other tasks such as conducting research to improve teaching and learning. Quiz Master is the solution. To provide accurate results or scores and also provide analysis on students’ performance based on the scores with interpretational graphs. To save time for the teacher to do other research; no need for marking scripts, cross or double checking or even recording scores, just export it. 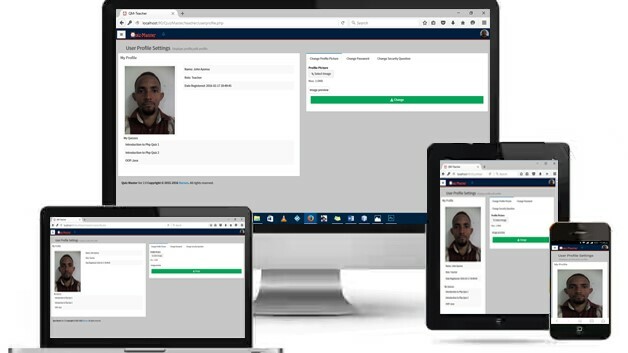 To help students to access their results at any time and anywhere. It’s easy to use. 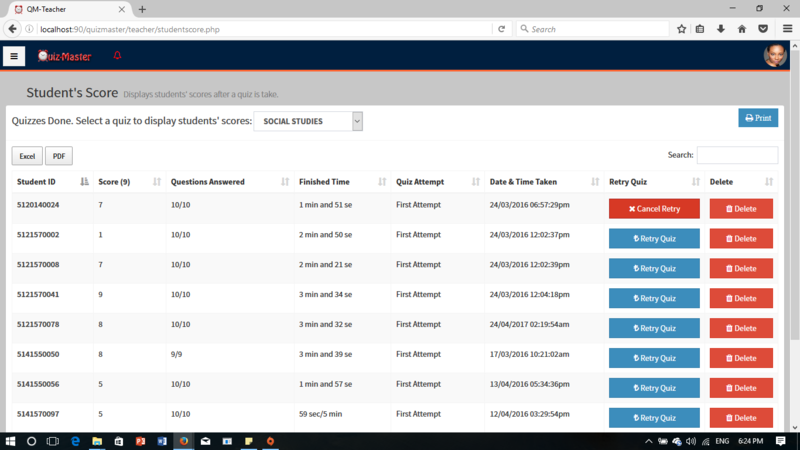 It involves no administrative user, only the examiner and students. It comes with an intuitive design and simple layout that makes it easy to find your way around. It makes work easier. Of course, software is designed and developed to make work easier and faster. No worries about marking scripts, leave it with Quiz Master. After a test, Quiz Master draws charts that allows you to get an overview of students’ performance. If you're still worried about typing all your questions individually, that’s not a problem at all. 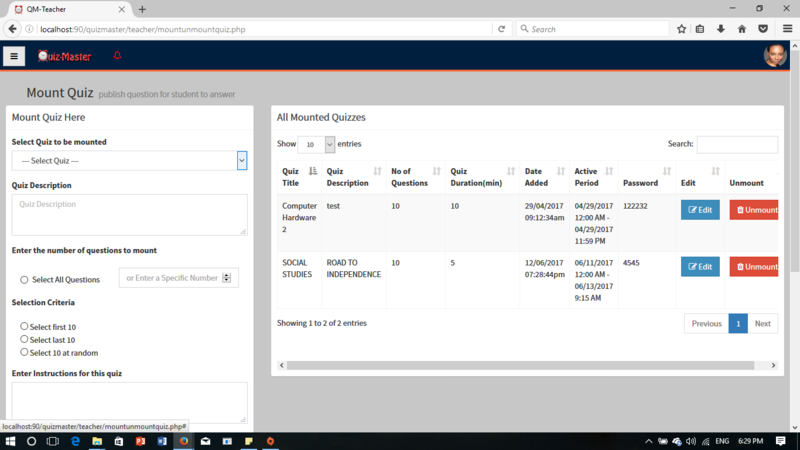 Text Dump is a feature in Quiz Master that allows you to copy your questions from Ms. Word and paste all at once. This feature will automatically pick out individual question items with their corresponding options and pick out the key (the correct answer) just like typing individual question items and options but this time a lot faster. Multi-choice quiz; you can set multiple choice questions, i.e., objective test items, true or false, fill in the blanks etc. Question Bank; your questions are never lost after a test; they’re permanently stored unless you choose to remove them. You can share your questions with other colleagues. You can even share your questions with exclusive rights and permission that will still give you absolute control over your questions. Also, you can decide to download or export your questions. Support for multiple devices; Quiz Master can be accessed on multiple devices. You can open it on a desktop computer, laptop, tablet or smart phone. Quiz master is responsive, that is, it automatically adjusts its screen size and adapts to fit on the device accessing it. This makes it a lot easier to navigate your way around it. Quiz Master comes with many other features including user profiles and settings. Currently, Quiz Master has been deployed and it’s being used by the Department of ICT Education. It has been used to conduct several quizzes successfully. The developer hopes to expand its access to other departments and eventually the entire University. Ebenezer A. Barnes is a graduate of University of Education, Winneba, and studied with the Department of ICT Education. He is currently doing his Teaching Assistantship with the department. His interest is in computer programming, where he applies programming skills to solve real life problems. He also likes to share his programming experience with colleagues and friends to help others solve real life problems and build up teams that will help develop the world faster and better. Personal Translator, a companion for visually impaired students to help them in their studies. There are few more software to be published soon by the developer.